When a young village girl (Kulkarni) is attacked and later abandoned on the eve of her wedding, she finds solace in the unlikely form of a transvestite folk singer/actor (Pandey). She, disguised as a man, and ‘he’ as a woman, embark upon a journey of mutual self discovery and enlightenment, examining issues of identity and gender stereotypes – and finding love – along the way. Set against the vast rural landscapes of India, THE SQUARE CIRCLE is a tragic-comic love story that will leave you surprised and deeply moved. Coming soon for the first time on DVD. Steeped in music, magic and mystery, TALES FROM HOFFNUNG AND RUDDIGORE are spectacular films from Britain’s first animation studio: the legendary Halas & Batchelor who are behind such fine animations as ANIMAL FARM and DILEMMA. Based on the weird and wonderful world of Gerard Hoffnung and the Gilbert and Sullivan classic, TALES FROM HOFFNUNG AND RUDDIGORE will delight children and music lovers everywhere. 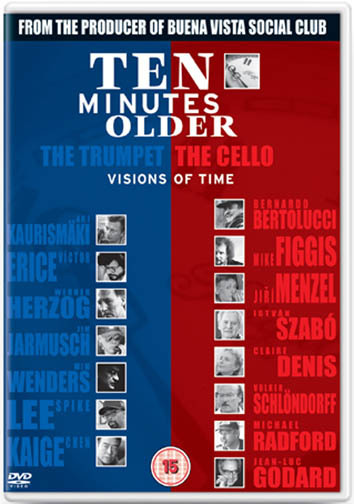 Ten Minutes Older 'The Cello' is the second of two feature length compilations of short films exploring each participating director’s personal vision of time.This film showcases the contributions of eight further auteur directors – bringing the total contributors to fifteen – and features films from Bernardo Bertolucci, Mike Figgis, Jiří Menzel, István Szabó, Claire Denis, Volker Schlöndorff, Michael Radford and Jean-Luc Godard. As in Ten Minutes Older 'The Trumpet', each short is linked by a musical instrument (in this case a cello), allowing each picture to have its own frame. The musical interlude is performed by Claudio Bohorquez and was scored by Paul Englishby. The subject of Time has infinitely fascinated writers, philosophers and scientists. Conceived of by British producer Nicolas McClintock, the award-winning documentary maker wondered how different film directors might view the subject. Ten Minutes Older 'The Trumpet' is one of two feature length compilations of movie shorts by some of the world's most renowned film directors with contributions from Aki Kaurismaki, Victor Erice, Werner Herzog, Jim Jarmusch, Wim Wenders, Spike Lee and Chen Kaige. Each film is linked by the respective musical instrument in its title and the musical interlude (scored by Paul Englishby) between each film connects each short in a gentle manner, allowing each picture to have its own 'frame'. The theme tune from Ten Minutes Older The Trumpet is from legendary Jazz maverick Hugh Masekela and the feature includes contributions from bands including The Eels. Dublin, circa 1960. Harry Cronin (Hickey) is a lonely young boy who believes that he and his dog, Max, come from the planet Mercury. 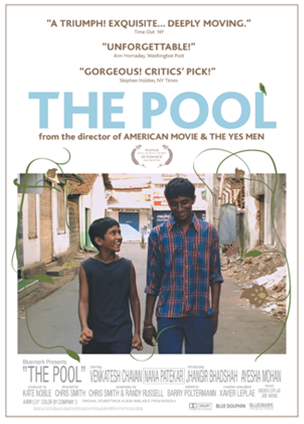 A touching portrait of childhood and life as an ‘outsider’. From writer/director Joseph Cedar comes TIME OF FAVOR, a gripping psychological thriller of a man whose whole life comes into question when a plan to bomb the sacred mosque on the Temple Mount is discovered. Starring Aki Avni, Tinkerbell, Edan Alterman, and Asi Dayan, the film won six Israeli Academy Awards: Best Picture, Best Screenplay, Best Actor, Best Actress, Best Editing and Best Cinematography. The film was Israel's official entry for the Oscar of Best Foreign Film 2001. A highly acclaimed, gripping examination into the fear-tactics, scare-mongering and politics of manipulation the American government employed to justify their reasons for going to war with Iraq. It investigates the validity of the evidence and information sold to the US Congress and the American public in the run-up to war. Resisting the use of spectacle and sensationalism to get its message across, the film gives us the opportunity to see a more thorough view of these troubling circumstances for the first time. With the current concerns over global warming and the future of humanity seemingly hanging in the balance, comes a story of hope, awakening and reconciliation. 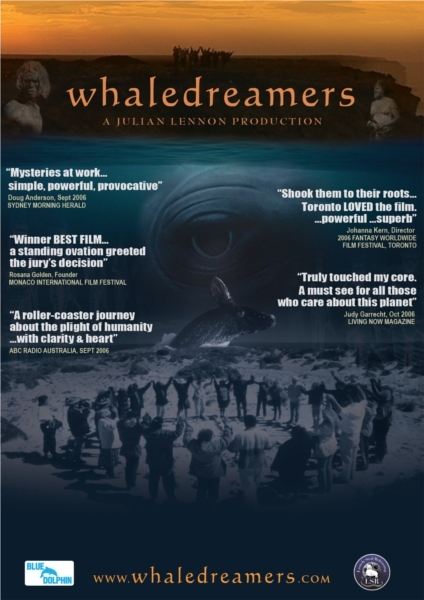 Whaledreamers is the story of how an ancient whale dreaming Aboriginal tribe, the Mirning people from South Australia, comes back from the edge of extinction. Singer/ songwriter Julian Lennon, presents (and narrates) this award winning film and has written the title song for it.. Lennon has also contributed a track for the film, which will be released as a single. There will also be a Whaledreamers soundtrack featuring original songs and music.